I had my learner's permit, but that meant I couldn't take anyone for a ride or ride after dark. Instead of just taking the usual auto driving test to get my license, I elected the free PennDOT Motorcycle Safety Training Course. I qualified for the "Experienced Rider" course rather than the Beginner course since I have a few years of riding under my belt, albeit a long time ago. 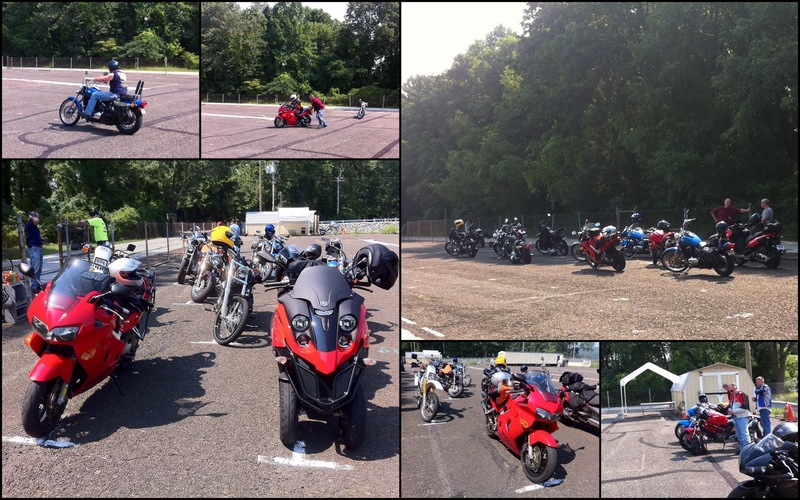 I spent 6 hours on a very hot Saturday morning in August with Harley and sport bike (aka "crotch rocket") riders. Out of a dozen students, I had the only "scooter". Kind of intimidating. Interestingly, three of the other men were "middle-aged" like me and had a similar story - kids in college, time to have a bit of fun! One was an obvious hot-dogger sport bike adrenaline junky and bragged about doing 120 mph on the expressway coming to the class. You can see my Piaggo above in the right-side of the left-hand frame. Two bikes needed to be pushed to start because their batteries died because of all the low-speed maneuvers. A couple of riders said they take the course every couple of years to keep up their skills. A wonderful free service. Learn more at http://www.livefreeridealive.com/.